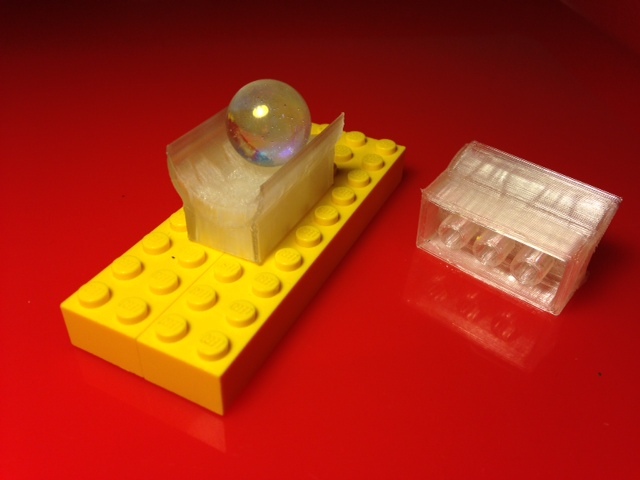 Today our 8-year-old jumped into the print-a-day game with a sample piece for a marble run to be built on top of LEGO pieces. Using Tinkercad he combined a short piece of marble track with a LEGO brick in Tinkercad's public files (credit to Kerry Todyruik). Settings: Standard MakerWare "high" with raft but without supports. Supports mess up the inside of the LEGO part, and without a raft we ended up printing a lot of fuzz. On "low" setting (about 30 minutes to print) the marble track would not fit on the LEGO bricks, so we had to change to "high" (about an hour to print). Technical notes: Our marbles looked about 16 mm across so we made a run with a 20 mm cylinder track. This part seems perfect; the marble rolls very nicely in the track. Stuff you might want to change: This is a work-in-progress. The fit on the LEGO bricks is very tight so some fiddling with the design is in order. Also we'll have to design more interesting bits of track than just small straight bits, and some modifications in design are needed to make the printing go faster. Stay tuned.